Starting the 17-18 ski season Blizzard debuted the new freeride oriented Rustler series with the Rustler 10 and Rustler 11 which have 102mm and 112mm waist widths respectively. New for 2019 Blizzard brings out the new Rustler 9 which features the same construction and technologies, just a narrower 92mm waist. What’s so hot about the Blizzard Rustler 9? With such great success with skis like the Cochise, Bonafide and Brahma some skiers found they they were a bit heavy and demanding with double Ti layers in each of them. Hence the birth of the Carbon Flipcore DRT which is found in all of the Rustler skis. The new Rustler 9 is set to be the talk of many chairlift rides this season. For starters the Carbon Flipcore DRT (Dynamic Release Technology) has a shaped layer of Titanal underneath the binding platform that extends out towards the tip and tail, but only in the center of the ski that stops before it reaches all the way out. DRT keeps the center of the ski torsionally stiff, responsive and powerful, but the tips and tails have a softer torsional flex. The softer torsional flex in the tip and tail gives a better soft snow performance while not sacrificing performance on the frontside of the mountain. A Unidirectional Carbon Insert in the tip and tail adds longitudinal strength while keeping a softer torsional flex. An Anti-Shock Layer below these inserts dampens out vibrations and eliminates tip wobble or flapping while also lowering the swingweight for easier maneuverability. The Carbon Fiberglass Compound sits just below the DRT Titanal layer to add an extra snap and spring to each turn without adding any extra weight. Blizzard’s Multi-Layer Core combines vertically laminated strips of ISO Material, Paulownia, Balsa, Poplar and Beech Woods that creates a very strong, yet lightweight feel. Who is the Blizzard Rustler 9 for? With its unique construction the Blizzard Rustler 9 can withstand the punishment from the most aggressive skiers to rip around the mountain and test their speed limits, but feel forgiving enough for the strong intermediate to hone their skills and explore terrain they have never tested themselves on before. With a 94mm waist (sizes: 164cm-172cm/94mm at 180-cm 188cm) you have a highly versatile ski that can pound through the bumps, slice medium radius turns on the groomers and give you excellent floatation up to about a foot of fresh powder. If you want a ski that is willing to tackle the entire mountain that feels light on your feet, but stable as a rock when you jump on it, the new Blizzard Rustler 9 is just the ski you are looking for. If you have sold the misses on a pair for yourself you may want to consider the brand new Blizzard Sheeva 9 for her, which features all of the same great technologies and performance, but in a women’s specific design. 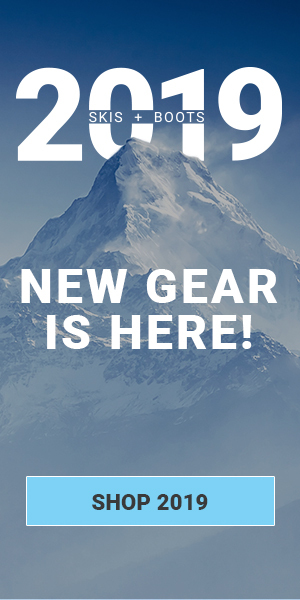 For more details, on snow reviews and all of the exciting 2019 Blizzard Products find out more at SKIS.com. And as always, don’t forget to check us out on Facebook and subscribe to our blog below for up-to-date info on all things skis. just rode these over the last few days and can say they come as advertised for the groomers. Was able to really lean into them and could hold a solid carve turn throughout. was very stable at speed and responsive as well in some short bump runs. can’t wait to see what they can do in some fresh snow. That’s great to hear Rich! I have a feeling you’re going to love them in the soft snow too! Have you had a chance to ride the Rustler 9’s in fresh powder? I’m curious on the performance of Rustler 9 performance in pow. We have! They perform extremely well in fresh snow, as they have plenty of rocker in the tip and tail for float. They pivot and slash turns really nicely, but are not what I would call “super surfy”. You can break them loose easily to slash turns, but they still stay very connected to the snow most of the time. I would say these are a little narrow for a lot of people in over 6″ of snow, but if you are a pretty light person (150ish) you could still ski pretty deep stuff on the largest size.